The Dolder Waldhaus has been part of Zurich’s cityscape for over 100 years. However, the present building – which dates from the 1970s – no longer meets the operational or architectural requirements of our well-travelled guests. The building will be replaced with a brand new construction following an interim period, which will see it made available for temporary use until January 2020. The rooms will be used for the purposes of living, storage and work during this period, and in the public rooms will to host a limited number of individual events. The period of temporary use is being run in conjunction with Projekt Interim GmbH, which boasts considerable experience in this area having already successfully realised a number of similar projects throughout various cities in Switzerland. The horizontal lines of the new Dolder Waldhaus strike a self-assured silhouette in an area laden with residential villas, while also complementing a string of larger buildings along the top of the Adlisberg mountain. From the city below, it is viewed as a single entity together with the Dolder Grand. Built alongside the Dolder Railway at the turn of the century, the curved building with its concave and convex panels embodies an urbanistic landscape concept that represents a multi-dimensional topographical model, an architectural design and an open, urban villa development. Its proximity to Zurich’s Altstadt district, the lake and the wider city are as much a feature here – a large metropolis and a small town in one – as the inspiring landscape, where local parks are capped with panoramic mountain views. 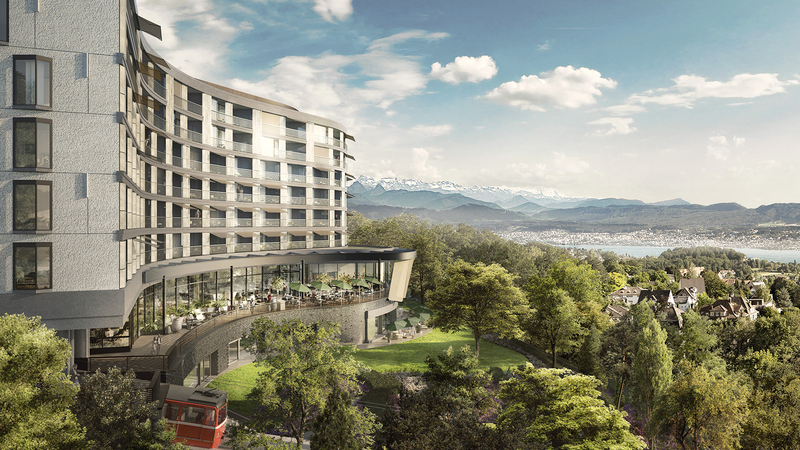 The planned four-star superior hotel will occupy different levels and feature 97 generously proportioned hotel rooms and suites, each of which will have its own balcony and views of Zurich, the lake and the Alps. With its versatile accommodation options, the hotel will be able to meet the needs of a variety of guest segments. On the sixth floor, you will find nine serviced apartments with 2.5 to 4.5 rooms and an exceptional panoramic view. The restaurant planned for the lobby floor of the new Dolder Waldhaus will also offer spectacular views over the city and lake, while the raised terrace and outdoor lounge will provide a smooth transition to the lobby and bar. The 800 m2 hotel spa – boasting a pool, sauna, children’s water play area and gym – will provide a pleasant space for activities and relaxing rejuvenation. Spa-goers will enjoy beauty and body treatments in dedicated rooms. In addition, the spa will not only be open to hotel guests; members and day guests will also be able to use its services and facilities. Finally, a villa will be built containing four luxury rental apartments. This building features expressive volumes and fantastic outdoor spaces – in an architectural style first used in an urban context in 1925 by the Casa della Meridiana in Milan. The designs of the individual floor plans are organised in a variety of ways around extra-high living areas, versatile spaces and captivating views. The building will be managed separately by the hotel management and will have its own entrance on Dolderstrasse. Would you like to find out more? For detailed information on the project, please download our information kit below. The architectural firm Meili, Peter & Partner Architekten AG has been setting standards in Zurich since 1987. Alongside buildings like the Park Hyatt Hotel and the Swiss Re Centre for Global Dialogue, its work includes a number of experimental projects such as bridges, movable information boxes, theatre sets and even a film. 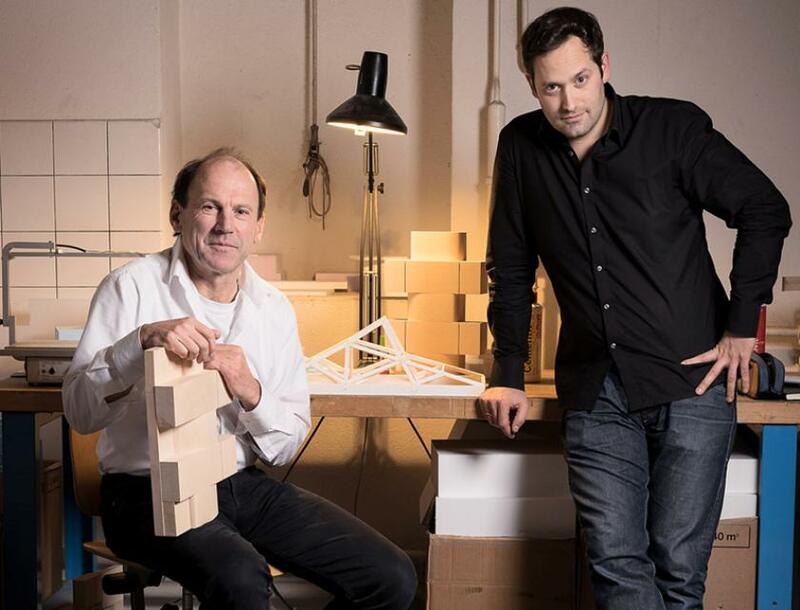 Marcel Meili and Markus Peter win most of these projects through national and international competitions. Meili, Peter & Partner Architekten AG is now responsible for the Dolder Waldhaus project. The secret to the company’s success is excellent teamwork with other architects, allowing it to provide outstanding architectural quality even when subject to complex requirements. Its work also benefits from a keen interest in the history of architecture and the city. The firm’s current projects include the Sprengel Museum in Hannover, Zurich’s Zoelly high-rise residential building, the Zurich-Freilager shopping area, the Toggenburg Klanghaus and the Max Felchlin AG customer service centre in Schwyz. Subscribe to our free newsletter to receive regular updates on the project.